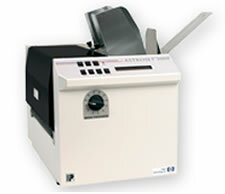 FP AJ-500 is a fixed-head, entry-level inkjet address printer. They offer 1.5” of print area and a durable area and a durable feeding/transport design. The FP AJ-500 envelope printer system has a variable head and extended hopper that can hold up to 500 #10 envelopes at a time. It also can take materials up to a class-leading 3/16” thick. It is capable of printing IMB including USPS® Delivery Point Barcodes, to qualify for lower postal rates and faster delivery.